Water damage happens often in the home and nobody wants to go through the inconvenience that this event can cause. If your home has been damaged by flooding, getting help quickly is critical. Paul Davis in Polk County is that firm and we’re ready to respond to your flooding 24 hours a day, seven days a week. 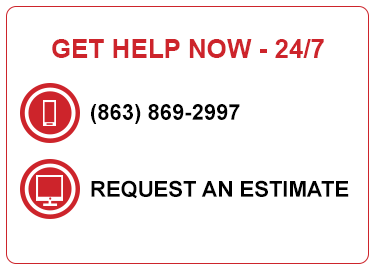 If you need Help, call us at any time or use the “24-hour Emergency Services” button. We’re dedicated to getting back to you within 30 minutes and be onsite within four hours. Why is using a certified water damage repair firm important? The process of removing the water from and drying out the affected area involves specialized equipment and scientific methods. Water can quickly soak into the subfloor and “wick-up” into the walls, which can only be detected by moisture meters and infrared cameras. This is why it is vital to trust an experienced company so you can steer clear of costly repairs in the future. Find out what you can do before we arrive and get helpful water damage information and tips here*. You can’t adequately dry an area that has been affected by water damage with a Shop Vac and a fan. Let the experts at Paul Davis in Polk County help you return to your home as quickly as possible.